Each month's payment is equal to the interest rate times the principal, plus a small percentage of the principal itself. Since a bit of the principal is paid off each month, that makes the interest payment on the remaining principal a little less too. As a result, more of your monthly payment goes toward the principal each month. Therefore, at the beginning of the loan, most of the payment goes towards interest while most of it goes towards principal at the end of the loan. The interest rate is usually just a little higher than that of the 30-year Treasury bond at the time the mortgage is issued. That's because investors are looking for something that provides more of a return without adding too much risk. That's how Treasury notes affect mortgage rates. The advantage of the fixed rate mortgage is that the payment is the same each month. This predictability makes it easier to plan your budget. You don't have to worry about future higher payments like you do with an adjustable-rate mortgage. You pay off a little of the principal each month. That automatically increases your home equity. That's unlike an interest-only loan. You can make extra payments to pay off your principal earlier. Most fixed-rate loans don't have pre-payment penalties. It's also a great loan if you think interest rates will go up over the next several years. That's because your rate is locked-in. The disadvantage is that the interest rate is higher than either an adjustable-rate loan or interest-only loan. That makes it more expensive if interest rates remain the same or fall in the future. Another disadvantage is that you pay off the principal at a slower rate than with an adjustable-rate loan. That's because the payments over the first few years primarily go toward interest. Therefore, these are not good if you plan to sell your house within 5-10 years. It's difficult to qualify for fixed-rate loans. You will pay higher closing costs for a conventional loan. Both of these are because banks may lose money if rates go up. That's a big risk for them to take for a 30-year loan. They want to be paid to cover that risk. If you plan to move in five years or less, get an adjustable-rate loan. Some mortgage brokers will sell you a so-called fixed-rate mortgage where the rate is only fixed for the first five years. Make sure the interest rate they quote you is good for the entire life of the loan. A no-cost loan is really where the closing costs are rolled into the loan itself. You wind up paying more over the life of the loan because you are paying interest on those closing costs. Your monthly payment may rise if real estate taxes, home insurance, or mortgage insurance rates rise. A 5-year fixed rate mortgage maintains the same interest rate for the first five years. It then turns into an adjustable-rate mortgage. The advantage is that the initial interest rate is lower than on a 30-year mortgage. The disadvantage is what happens after five years. Your interest rate could increase rapidly, depending on what current rates. Therefore, this is a good loan if you're sure you will sell within five years. A 15-year fixed rate mortgage is very attractive because it has lower interest rates. It also allows you to pay off the principal faster than with a conventional 30-year loan. That means you build up equity faster. On the other hand, 15-year mortgages have higher payments. For that reason, there's a slightly higher risk of default if your income drops. A 30-year mortgage is the most affordable conventional loan. Even though it has higher interest rates, the monthly payment is lower because the loan repayment is spread out over 30 years. That is a good loan if you plan to stay in your home for a long time. 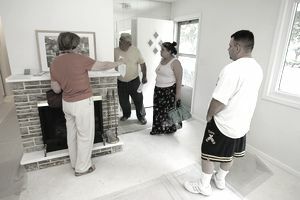 It's also good for lower-income families because it allows them to buy more house with a lower monthly cost. Interest rate trends have been declining since 1985. That's because inflation has been under control since then, thanks to expansionary monetary policies of the U.S. Federal Reserve. That has led to low rates on Treasury Bonds. As a result, the interest rates on 30-year fixed rate mortgages have been below 7 percent since March 2002.